First appeared on Aircrew Book Review 24 March 2016 http://aircrewbookreview.blogspot.com.au/2016/03/a-true-story-of-great-escape-louise.html. 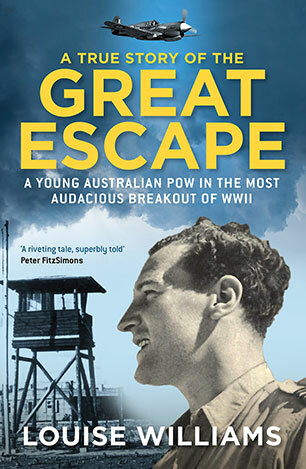 The author of A True Story of the Great Escape is the niece of John Williams, one of five Australians killed on Hitler’s order after the mass breakout from Stalag Luft III. Little was known about John’s fate, other than the fact of his death, and Louise Williams has devoted much of her life to discovering exactly what happened. Despite the author’s connection to John, this is not just his story, nor is it simply a retelling of the Great Escape from an Australian perspective. It follows the career of John’s friend and fellow escaper Reginald ‘Rusty’ Kierath. It encompasses those who were affected by John’s death, particularly his mother, Mildred. It also chronicles a family’s unresolved grief across half a century. Finally, it tells of Louise William’s journey to piece together the jigsaw puzzle of John’s life and death and provide closure for herself and her family. Williams faced many challenges. Some of John’s letters were destroyed in storage, there are gaps in the chronology where no records or witnesses exist, and other participants who could have shed light are now dead. To overcome these obstacles, she had to look sideways and around. Supplementing extracts from John’s extant letters, family reminiscences, and official documents, Williams fleshes out the known with vivid genealogical surveys and explorations of his school ethos, his home suburb, surf life-saving and surf sports. John is thus placed within a social and historical framework which illuminates the scanty personal record. Much of John’s Royal Air Force service is known. He excelled as a trainee pilot and was granted a pre-war short service commission. Instead of a posting to an operational squadron, he became an instructor. After transferring to the Western Desert, he gained experience in RAF squadrons before notching up a series of victories for 450 Squadron RAAF as one of its new flight commanders. He gained a reputation as an aggressive pilot and the culmination of his flying career came when he was promoted to commanding officer. The 23-year-old’s promising leadership stint, however, was cut short when he was shot down by one of his own men in October 1942 and taken prisoner. What is not known is why John embarked on the Great Escape and what happened in the moments before his death. These essential mysteries are at the heart of A True Story of the Great Escape. While the author knows that these final secrets will probably never be uncovered, she has provided some clues. Fellow escaper Bertram ‘Jimmy’ James, for example, shares what went on his mind before and during the escape, thus giving some hint to John’s thought processes. Perhaps the most telling clue, however, comes from John’s close-knit family life which is lovingly described (with no sign of rose-tinted glasses). Maintaining the familial link to her son, Mildred’s weekly letters reinforced that John was a much-loved and much-missed son and brother. John diligently wrote back, demonstrating that for him, too, the bonds had not slackened during his long absence. Captivity is not an easy state but, for many, a continuing connection to home makes it bearable. Paradoxically, that closeness also makes incarceration unbearable and some yearn to go home. When that desire is enacted, the prisoner is willing to take any risk, as John did. But when risk leads to death, grief is more intense than if a beloved son had been lost in battle. There is honour in combat and solace in knowing that he had done his duty in contributing to the undoubted victory but, in breaching the Geneva Conventions which had provided surety of John’s safety, there had been nothing honourable about his murder. Mildred’s grief was bitter and intense. It was never assuaged, and percolated down to the next generation. A True Story of the Great Escape is a saga of compelling sadness and keen tragedy. Even so, we recognise the joy of a life lived well and full, despite its brevity. Perhaps the central mysteries of John’s death can never be explained but through Williams’ poignant account we gain a firm sense of the man and can imagine why he participated in the Great Escape. Even if we don’t know exactly what happened in his last moments, this moving and well-illustrated story of discovery and the consequences of war leaves us in no doubt about its impact.